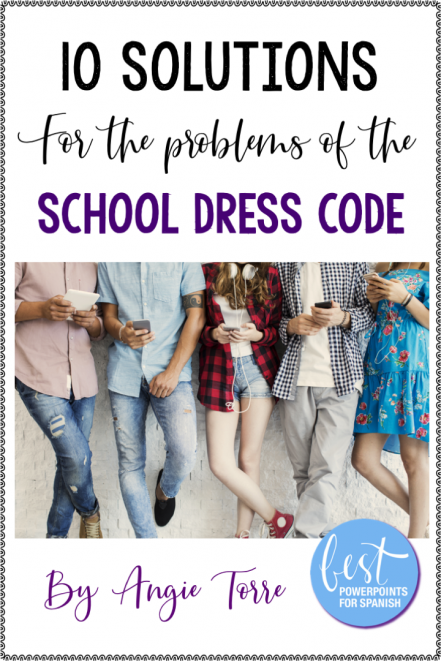 In this post, we’re going to talk about how to solve the sticky problems associated with enforcement of the school dress code and why guidelines for attire are needed. Supervision at school dances where the music vibrates my bones, fire-drill practices, P.D. on how to administer standardized tests, and the enforcement of the dress code: all non-instructional duties I’d really rather not have to deal with. But we must enforce the school rules! Right? Why? Conduct by the student, in class or out of it, which for any reason materially disrupts classwork or involves substantial disorder or invasion of the rights of others is, of course, not immunized by the constitutional guarantee of freedom of speech. Cf. Blackwell v. Issaquena County Board of Education., 363 F.2d 740 (C.A. 5th Cir.1966). Schools may limit student expression (such as enforcing dress codes) if there is a legitimate concern that such expression will be disruptive to the learning environment or violate the rights of others. The Supreme Court ruling notwithstanding, do we really need a dress code? If so, why? The dress code is established to promote a positive, psychologically safe, and appropriate learning environment. Extremes in dress or clothing regarded as disruptive or a distraction from the learning environment are not permitted. Of course, what is distracting is subjective. Click HERE to see what our school deems as distracting: Del Campo High School Dress Code. Upon researching this topic, I realized I had opened a can of worms. Body-shaming? Gender bias? Wait…what? Maybe I DON’T want to write this post. I don’t relish starting my days with hate mail. It’s hard enough to focus on complicated concepts when there are NO distractions. Every teacher knows that the first downpour of the season will cause all students to rush to the window to gaze upon the natural phenomena as if they had never seen rain before. Lesson tank. Or if there is a spider crawling on the floor. Lesson tank #2. What constitutes a distraction? I’m not going to address the issue of body-shaming or girl-blaming. OK, I am. Do you think that if a girl wears provocative clothing, a teenage boy can easily continue on as if she is not and focus on the lesson? Sure, he can control what he DOES, but he cannot control his hormones. A scantily-clad girl will be a cause of distraction. If someone turns on strobe lights in the classroom, it may still be possible to learn, but only with extreme concentration. The goal is to set the stage for an optimum learning environment, not to push the envelope, demanding that the joy-killers define what “provocative” is. Sure, boys cause distractions, too, but mostly by their behavior. Girls, in general (yes, I am making a generalization) are not as visual as boys. And boys do not have cleavage. To say the dress code is gender-biased is to ignore the fact that men and women have different bodies. What would be distracting on a female would not usually be distracting on a male. That said, we will discuss below how to word the dress code so as not to offend those who feel they should not be biased against females. Reduces pressures based on socio-economic status. If everyone wears a uniform or adheres to strict dress guidelines class differences will not be as noticeable. Headbands, jewelry, gang names, gang symbols should be prohibited. We really don’t want gangs in our schools, right? Creates a disciplined school environment, a culture of learning. Nearly every place has a uniform of some sort, a culturally accepted form of dress for that venue, and some places of work even have a written dress code. Maybe I’m an old fuddy-duddy but I always wore professional clothing to class to create a more disciplined atmosphere. I try to model what I want from students. I want them to be professional and to focus on learning. They can express themselves in their manner of dress in other places. It is more and more imperative that schools be a safe place for students. No jewelry that could be used as a weapon, such as spikes, hatchets or knives should be allowed. Vulgarity or wording that promotes drugs, alcohol or gangs should be prohibited as they would endanger the safety of the learning environment. Now that we’ve established the need for a school dress code, let’s look at the difficulties of enforcing said dress code and solutions to the problems. The school dress code is not applied equally to boys and girls nor is the wording equitable. Female students complain that the dress code is biased against girls and body-shames them. I have no problem admitting that boys and girls are different physically and in the way their brains are wired. Ignoring those facts, however, the same rules apply: The language of the dress code should be worded in a gender-neutral manner. No cut out tank tops for boys or girls, no underwear showing, no private parts exposed, no vulgarity, profanity, obscene slogans,…etc. Parent says to male teacher, “You shouldn’t have been looking there anyway! Why were you looking? You’re body shaming.” Male teachers are afraid to enforce the rules. Many male teachers in my school felt uncomfortable approaching a female student who was violating the dress code. However, they shouldn’t ignore the violation due to their discomfort. As an alternative, some teachers partner with female colleagues. For example, one teacher had an agreement with his next-door coworker. When there was a problem, she would come into the room, ostensibly to give him a requested item. Then she would subtly motion to the student to adjust her shirt or pull up his pants. Teachers don’t ask students to take off hats because they don’t deem them to be problematic or distracting. Communicate to teachers the security reason behind the rule. Hats hide faces from security cameras. Students proclaim the enforcement of the dress code is unfair. “She wore the same thing I did, and you didn’t say anything to her! Students complain the dress code prevents their self-expression. Administration tells us to enforce the rules, then doesn’t support us when we do. This is a real problem!! A male teacher was fired for giving consequences to a female student for a violation of the dress code. The teacher fought the firing in court and won. The district then offered him his job back which he declined. The sister of the accuser, wearing a blouse that was half-on, half off, bragged about getting him fired. First, administrators need to communicate clearly with staff, parents, and students concerning the dress code: what is acceptable, what is not, and what the consequences are. If, after everyone understands what constitutes a violation and how to enforce the rules, you feel unsupported, talk to your administrator. Student feels embarrassed for being spotlighted. Give consequences without drawing attention to the student. The way I deal with this is to walk around the room, helping students, and, as I pass the violator, quietly ask him/her to cover up (as if I’m doing him/her a favor: “You don’t want to get in trouble for wearing that, right?”) If the student repeat-offends, then I apply the school consequence by providing him/her with a T-shirt with a school logo on it. Other teachers apply consequences during home-room or talk to the student after class privately. I don’t do that because a) I might forget and b) I don’t want the student to sit in class the entire period wearing inappropriate clothing. Cautionary reminder: Do NOT point to or touch the student’s clothing or the student. Otherwise, you could give the student an opportunity to make the issue about you. Complaints that students can’t afford to buy uniforms and that low-income students are discriminated against. Assist families financially. Have a uniform collection at the end of the year and give grad students extra tickets for donating. Those are workable solutions for low-income students. However, it must be noted that students who can’t afford uniforms would be even less able to afford regular school apparel, as they would need to buy more items to fit in with a fashion culture that requires a different outfit every day. No one knew we had no sense of style (we lived with our dad.) And I was so happy to not have to figure out what I was going to wear the next day. Hey, how about uniforms for teachers? No more decision fatigue! The dress code prevents student expression. Students can express themselves in other ways: hair styles, writing, speech, presentations, athletic prowess, political pursuits, drama, etc. When it comes to uniforms, students can choose their own ties or accessories. Enforcing the dress code takes a lot of time and effort with little or no change in student behavior. Save yourself the struggles and require uniforms. So, why don’t more schools require uniforms? Are we afraid of one big student riot? Get the big one over with so you don’t have to deal with daily rebellions and distractions. I hope some of these school dress code solutions will be helpful to you. Stay tuned because next month we will talk about the SUBSTITUTE DILEMMA. Would you like to be the first to hear about new products or updates on existing products? Make sure to FOLLOW MY STORE. Get More Freebies and Teaching Tips! You are saving this new teacher countless hours of work!!! The preview showed great resources and examples for AP students can't wait to begin using! Worth every single penny. Gracias for all your time and energy spent on creating awesome curriculum! Such a lifesaver! Love the lessons! Creative and excellent resources. Thanks so much. You made my year much easier. My kids loved it and said it helped clarify this very difficult concept. Muchas gracias!